The SCSPCA has increased the reward for information about this case from $2,000 to $3,000. 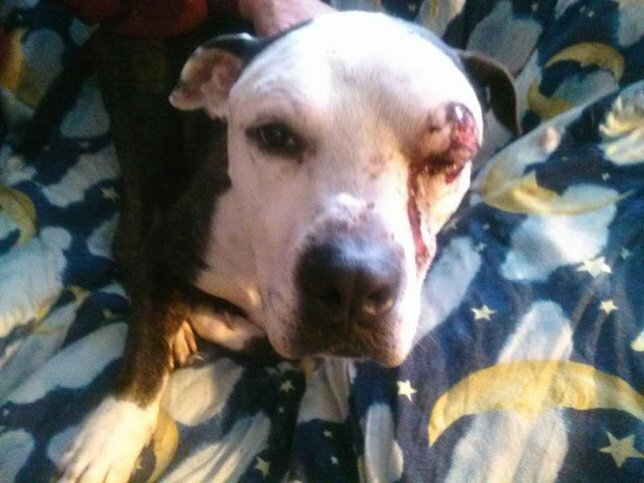 The Suffolk County SPCA has increased the reward offered for information leading to the arrest and conviction of the people responsible for throwing a pit bull from the window of a vehicle in Mastic Beach this February. Hap, as investigators later discovered the canine’s name to be, was witnessed thrown from the window of a dark, four-door pickup truck last month. After hitting the ground, he turned and tried to run back towards the truck, but could not catch up with it; the witness pulled over to make sure he was alright, and took him to a nearby veterinarian. After Dr. Dennis Dougherty treated the dog for his injuries, the investigation led to his owners and Hap was reunited with his family. Detective Roy Gross said that Hap was happy to be home, but that the people who threw him from the truck were still at large. “This is a blatant act of Animal Cruelty and we will do everything we can to see that those responsible are apprehended,” stated Gross. The SPCA is hoping that increasing the reward from $2,000 to $3,000 will incentivize someone who knows the people responsible for Hap’s injuries to come forward. Anyone with information on the incident is asked to call the Suffolk County SPCA at 631-382-7722. All calls will be kept confidential. The decision to increase the reward comes just days after a Freeport man was arrested after a house fire led authorities to find a variety of dog fighting equipment and 16 pit bulls inside his home. Sadly, 13 of the dogs did not survive the fire. Subject: LongIsland.com - Your Name sent you Article details of "Suffolk County SPCA Ups Reward for Info About Dog Thrown from Car in Mastic Beach"